Starring Edward G. Robinson, Vivienne Osborne, Guy Kibbee, Preston Foster, J. Carroll Naish, Berton Churchill, William Janney. Adapted from the stage, Mervyn LeRoy's Two Seconds is a cautionary tale that updates the predatory female "vampire" morality play to New York in the Depression. As if seeing the need to spell out the reasons why young men should avoid the Wrong Kind of Woman, the play charts the destruction of a good guy who foolishly trusted a dame. 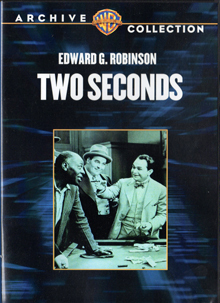 The film might be a hoot if it weren't for a terrific performance from Edward G. Robinson. It may have been conceived as a thrifty star vehicle, but it comes off as one of the actor's more memorable roles. With a big nod to Ambrose Bierce, Elliot Lester's play uses an unusual flashback structure. Convicted murderer John Allen (Robinson) is about to die in the electric chair. A grim prison doctor tells us that when they throw the switch, the victim is instantly paralyzed. But it will take two seconds for him to die. Before you can say "Owl Creek Bridge" we're transported a year into the past, where skyscraper riveter Allen works happily with his pal and roommate Bud Clark (Preston Foster, a year before his Technicolor horror film Dr. X). Sick of getting stuck with blind dates that always turn out overweight and hungry, John avoids two street girls looking for a free meal. Times being what they are, all the women seem to be hungry. But John falls fast for dime-a-dance girl Shirley Day (Vivienne Osborne), after 'rescuing' her from a dance floor masher. Their romance begins on the cautious and sweet side, until Shirley shows her true colors. She gets John tanked up on booze and connives with a Justice of the Peace to marry him when he's too delirious to know what's happening. Shirley is really a clever tramp eager to exploit the respectability of a wedding license, so she can (presumably) be pimped by Tony (J. Carroll Naish), the slimy dance hall proprietor. She's soon wearing fancy clothes. A tragedy high in a skyscraper causes John to suffer a nervous breakdown. Locked in his room and humiliated by Shirley, he quietly plays the horses in hopes that he can get enough money to repay the money Shirley's given him and regain his pride. But by this time the evil Shirley has driven John entirely insane. John begins as a construction daredevil walking on narrow girders high above the city, and his transformation into a quivering mass of nerves is quite impressive. Depression fables made a motif of death plunges from tall buildings (Skyscraper Souls, Golddiggers of 1935, even King Kong), and this story uses such a fall to motivate John's breakdown. Although John and Bud see nothing wrong with picking up girls on the street, Two Seconds subscribes to the belief that women are just plain Evil. We don't get much of a look at Bud's virtuous girlfriend, but Shirley is presented as a walking disease eager to corrupt any poor fool who crosses her path. The play's thesis is that tramps are intolerable because they emasculate good men like John. Shirley causes John to lose his livelihood. The notion that any respectable man would allow his wife to work is intolerable, almost a justification for murder. John Allen kills to protect the macho prerogative. Edward G. Robinson holds the screen as if movies were invented to exploit his personal talent. His final scene plays out in a phantom courthouse, where John Allen goes mad and rages in a one-take monologue, much like Peter Lorre at the end of Fritz Lang's "M" (reviewed this same week!). Robinson works his emotions up four or five notches 'bigger' than usual, and he pulls it off like a champ. Vivienne Osborne is quite good as Shirley, who seems decent when we meet her but soon shows her true colors. Her sudden wardrobe change can only be explained by an employment switch to call-girl status, as her boss Tony doesn't look prosperous enough to keep such a fancy dolly. Pre-Code films are really Pre-Code Enforcement films. They don't put everything on screen -- the murder and execution are discreetly withheld from view -- but instead use their own system of signals to indicate forbidden content. Thus Shirley can be seen stripping down to her slip and stockings, and putting on a fancy dress that she previously couldn't afford. Despite John's whining accusations, he never spells anything out and the audience has to decide for itself how Shirley is earning her money. Ms. Osborne appeared nine years later in Gregory La Cava's interesting The Primrose Path, as another call girl who volunteers to show tyro Ginger Rogers the ropes. If John Allen hadn't intervened, the two films could be talking about the same character. All-purpose slimeball villain J. Carroll Naish hasn't got much to do, but Guy Kibbee and Berton Churchill make good impressions as a bookie and a Warden. We can tell that this film is Pre-Code when the Warden says he's going to "burn" John in the prison's hot seat, and sarcastically predicts that at least one of the witnesses will faint. After the Code was enforced, personnel associated with capital punishment would be portrayed as solemn, duty bound men of quality. Two Seconds begins and ends on the face of an impressionable college kid (William Janney) in the audience selected to witness John Allen's execution. In true Warners Depression-saga tradition, the final image shows this kid staring in horror at what he's witnessed. The idea is of course that Joe College has been given a glimpse of Hell, and will go forward into life taking care not to fall into the terrible trap that swallowed up John Allen, namely, Bad Women. In realistic terms the kid is reacting only to the execution itself, but the film plants the idea that he's witnessed John Allen's entire sad story along with the rest of us. Two Seconds works very well as a bare narrative, but in its underpinnings it's one of the most misogynistic picturea I've yet seen, Pre- or Post-Code. Playwright Elliott Lester also wrote the play that F. W. Murnau's City Girl is based on. It was immediately apparent why the Warner Archive Collection's DVD-R of Two Seconds had been recommended to me -- the restored image is virtually flawless, along with the film's crystal clear soundtrack. The chances are that the original elements for this great Edward G. Robinson drama have sat more or less undisturbed for over 75 years. Framing is correct and the image is rock steady. No trailer is offered. It's possible that few stills survive for the picture, for the package photo appears to come from a slightly earlier Edward G. Robinson gangster thriller, the entertaining Smart Money. Nyahh! See? !